Day 4: Wow, So Much Happened on This Day! From the first night watch Bridge Prayer session at midnight, until the last note of the Kisi Kids song of blessing at 10:30 pm ... the Lord followed a powerful Day 3 with a richly full Day 4. The morning session included honoring of the late Fr. Peter Hocken, and his presence loomed large over the major themes of the day. John Dawson, the leader of YWAM and the International Reconciliation Coalition, spoke in the morning session, and called up Ben Shirod. What followed was epic ... you can watch it all here, and below is a slightly condensed version of Ben's words. Thank you brother John. My name is Ben Shirod. I am an Amish farmer. I am part of the culture that is called “The Quiet in the Land”, the Amish people. We have been on a long journey. We migrated from Europe to America. We have found a place of refuge there. The Lord has called me out from my people to be a witness of His presence and of His power and of His anointing. He has called me to become a father in His kingdom. Fathers today are emerging out of every culture. So are the younger generation. The Holy Spirit is moving on the fathers to release their baton on the younger generation. The younger generation is picking this up. This is all a work of the Holy Spirit, that God’s Kingdom can find its real place here on earth, before His coming. 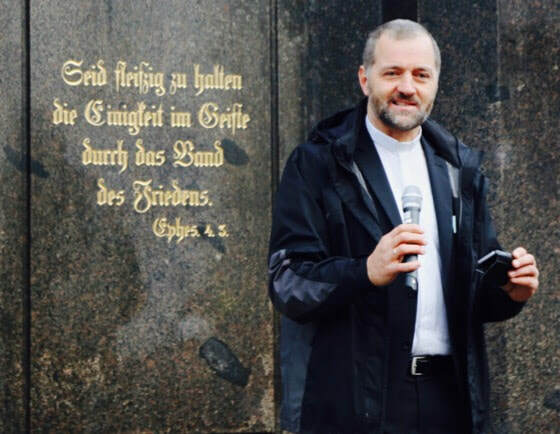 So I am taking this opportunity to release to you, the German people, the Swiss people, the people from Austria, the brothers from Poland, from Holland, all of you here gathered, I want to release my blessing. The Heavenly Father’s blessing that has come to me, I release to you. I want you to receive my blessing, and the blessings of my brothers who are here today, Mennonites from Pennsylvania and from Switzerland, that we can find our identity, our real identity, no longer to be quiet in the land, no longer be hidden, but emerge forth, to be who we are. 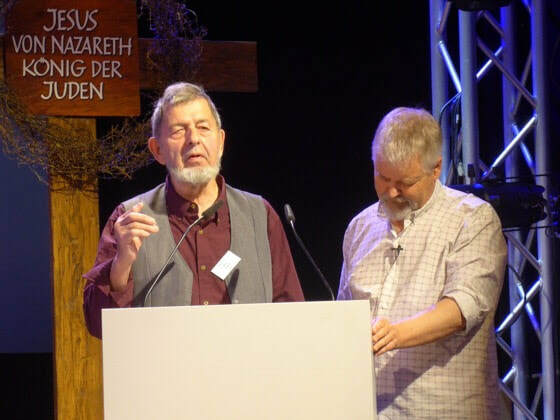 The Anabaptists that gave their lives on European soil, their blood is crying out for this moment, their blood is crying out for healing and for restoration, that we find what they couldn’t find, that we accomplish what they couldn’t accomplish, and that is, coming together in one heart, and one mind, and one spirit. I want to say to you, to the German speaking nations, “We love you, we love you from the depth of our heart.” And I take this opportunity to tell you, “You are blessed, and you have blessed us.” In Jesus name, our common Lord and King, Amen. Marianna Gol was born into a secular Jewish family in Russia. Now she is a lover and follower of Yeshua, the Messiah of Israel. most of Paul's references to "the mystery of God" address Jews and the nations becoming ONE through faith in the Messiah. 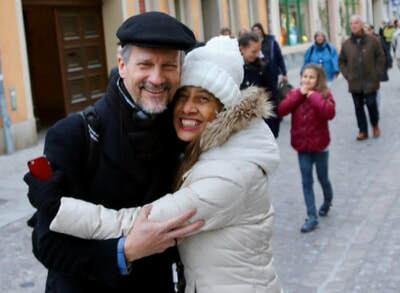 A worldwide missions leader who was in attendance spent the last hour of the musical weeping at the beauty of the unfolding of God's plan for the Wedding Feast at the end of time. Would you like to invite this musical to your city? The Invitation Into the Unity of the Trinity. The afternoon was given to a prayer pilgrimage. Below are pictures with brief descriptions ... come and walk with us through Wittenberg! The pilgrimage is led by Hanna Miley, a German Jewish survivor of the Holocaust who is married to an Anglican priest. Alongside of her walks Henning Dobers, a German Lutheran pastor. 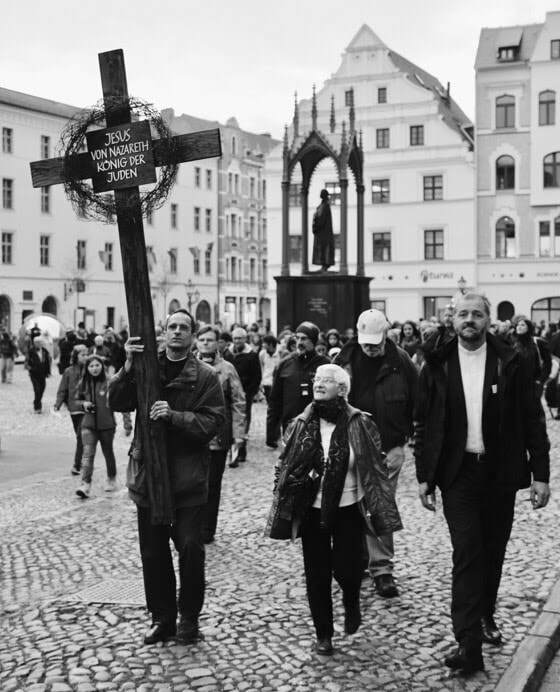 They accompany a beautiful cross carried by Brother Pietro, a Roman Catholic companion of the Lutheran Sisters of Mary (wrap your brain around that!). 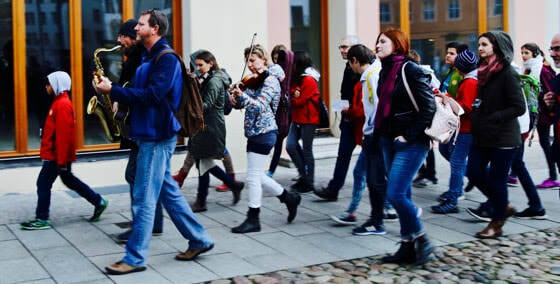 Next comes the musicians, and the young people -- who like music, and are the fast walkers! Our first stop is Luther's home church, the mother church of the Reformation - the Stadtkirche. 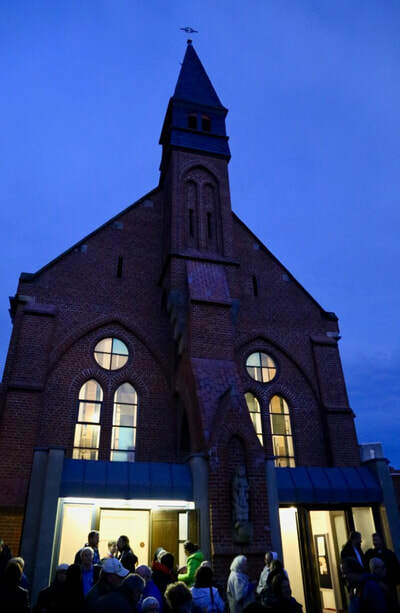 Prayers of thanksgiving and blessing for the history of this church and its current pastor and congregation arise from a Mennonite pastor and an Eastern Orthodox priest. 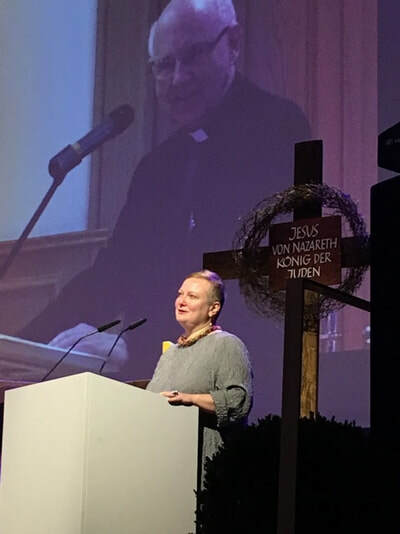 Sr. Joela Krüger, a German Lutheran, speaks of crowning Jesus as King of the Jews, and leads us in crying out, "Hail Jesus, King of the Jews" -- a powerful response to the "Heil Hitler" chants that had filled that church 80 years earlier (as Richard Harvey had explained to us earlier in the day). From the Stadtkirche we walk to the central square of Wittenberg, with the statues of Martin Luther and Philip Melanchthon. On the western side of the Melanchthon statue is Ephesians 4:3, "Make every effort to maintain the unity of the Spirit through the bond of peace." We recognize here that if you were to pile up all of the efforts of the body of Christ worldwide, the percentage of effort dedicated to "maintaining the unity of the Spirit" would be embarrassingly small. We own this truth in our own lives, and take time in this place to allow Paul to challenge us, person to person, to "make every effort" from this day forward. Nate & Jenny Bacon show us what the unity of the Spirit looks like! The Bacons are Roman Catholics working with InnerChange. They lead a company of Protestants and Catholics doing mission work among the poor in Central America, in the middle of perhaps the world's most bitter Catholic/Protestant divide. 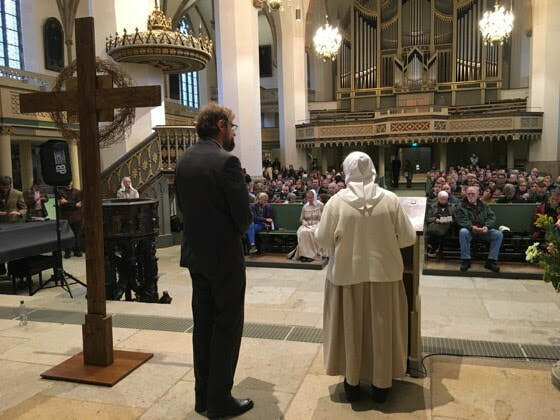 Our last stop is the Catholic church in Wittenberg - above is pictured Sr. Damiana of the Marienschestern, a Lutheran speaking blessing in this Catholic church. 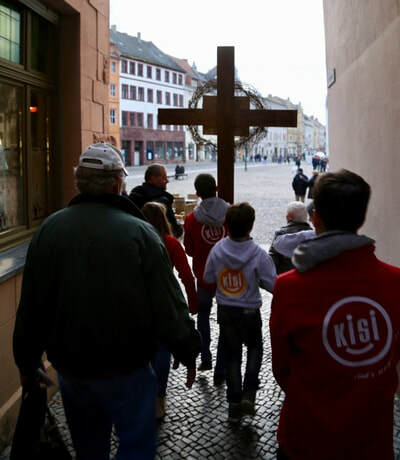 Have you ever wondered - what is it like to be Catholic, in Wittenberg? We are happy to learn that there are good working relationships between the Catholics & Lutherans in Wittenberg. 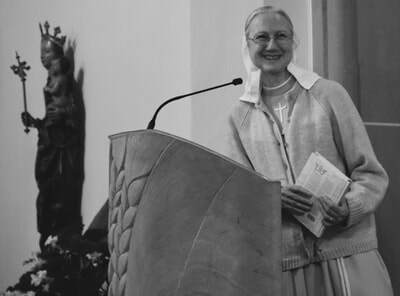 A Schoenstatt sister who serves this parish warmly welcomes us, and we sense a fitting end to our pilgrimage as we worship Our Father together, and then step out into the coolness of the Wittenberg evening.